Tawana has found her dog, but we still have a mailing list of people looking for the different forms of this dog. 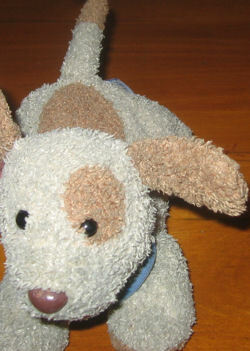 I am searching for a replacement Brown Carter’s Prestige wind up Dog Gone Cute dog. I was given the wind up dog at my baby shower in 2005. Woofie is the name of our son’s puppy. He carries Woofie where ever he goes. Woofie is a part of our family. He has worn out Woofie’s neck, and has not played a lullaby for quite some time. I have contacted Prestige in NY, and they only make each plush animal once. I have been online searching off and on for many months and came across your web page. Your help in our search is very appreciated.